As we finished up the final regular season day of the California Winter League, fans were treated to a full slate of games as all 12 teams saw action on the Palm Springs baseball facilities. The New York Colonials (9–6) and the British Columbia Bombers (7–6) had the early game at the Palm Springs Auxiliary Field. It was a pitching duel early as both teams were held scoreless through the first three frames until the Colonials’ Jack Kraft led off the top of the fourth with a solo home run. New York got another run in the fifth on a sacrifice fly to take a 2-0 lead. The Bombers offense finally broke through in the bottom of the fifth, scoring six runs, and British Columbia never looked back. 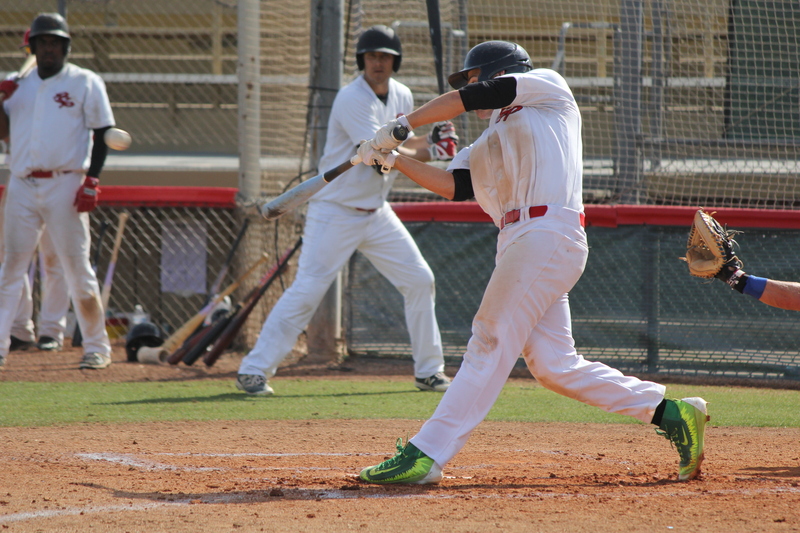 Thomas McGuckin had a run-scoring double and Louis Johnson had a two-run single in the inning. David Foster earned his second win of the season, going one inning and striking out a batter as the Bombers would go on to win with a final score of 8-3. The first game at Palm Springs Stadium featured Hit King (7–7) and the Toronto Rush (9–6). Entering the top of the fourth inning, Hit King was trailing 5-2, but they scored three to tie it up. Jimmy Pinakidis had the big hit, a two-run single, in that inning. Scott Carcaise got the lead for the Rush right back, blasting a 2-0 pitch over the right-field wall, making the score 6-5. The Rush came back in the bottom of the fifth and scored four more. Jabari Brown had a triple to bring in a run and Tanner Oymaian had a two-RBI double. The bullpen for Toronto combined to shutout Hit King in the final three innings as Norman Coleman-Goodwin earned his second win of the season and the Rush would emerge the victors 10-5. Game two at the Auxiliary Field matched up the Palm Springs Chill (11–3) and the Coachella Valley Snowbirds (5–10) as the Chill looked to clinch the number one overall seed. The Chill would win 10-1 as Tyler Eichhorst led the way offensively by going 2-for-2 with a triple and two RBIs. Ricky Schafer made the start for Palm Springs, hurling four shutout innings with four strikeouts, earning his league-leading fifth win. Jonathan Crank was the sole bright spot for the Snowbirds offense as he launched a solo home run over the right-field wall, tying him for the league lead with five. 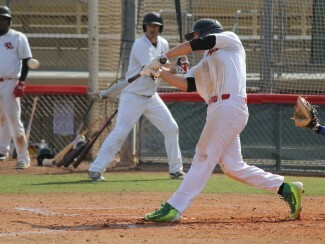 The second game at the main field turned into a slugfest between the Palm Springs Power (11–3) and the Alberta Grizzly (3–12). Alberta had leads of 6-1 and 9-3, but the Power exploded for six in the top of the fourth to tie it at nine. Daniel Moro and Brandon Oliver both had two-run doubles in the rally. Palm Springs would grab the lead in the fifth on a run-scoring triple by Aaron Marshall and got an insurance run on a moonshot from Marty Windisch that lead off the top of the seventh. Cody Beck went three innings of relief for the Power, keeping the Grizzly off the board and allowing just three hits to earn the win. Tanner Kiest got the save, striking out two Grizzly batters in the bottom of the seventh as the Power win 11-9. The Canada A’s (7–7) and the Oregon Lumberjacks (9–6) faced off in the final game at the Auxiliary Field. Jack Parenty had a double and an RBI while d’Aundray Van Slyke went 2-for-2 with a double in a game the Lumberjacks would emerge victorious. Final score in the game was 6-1. Robbie Kidd was the starter for Dennis Pelfrey’s Oregon Lumberjacks and earned the win, going two shutout innings. The third and final game at Palm Springs Stadium was a game between the Manitoba North Stars (6–9) and the Washington Blue Sox (3–12). The Blue Sox got on the board in the top of the first on an RBI groundout by Kyle Reese and Washington would hold that lead into the third inning until Bobby Dragon also grounded out to bring in a run, tying the ballgame at 1-1. In the bottom of the fourth the North Stars got a sacrifice fly from Lorenzo Wright and took a 2-1 lead into the fifth. Manitoba’s bats would come alive in the final innings as they would pull way starting in the bottom half of the fifth. Brandon Cloutier had an RBI single to make the game 4-1. In the bottom of the sixth a triple from Brad Dennis and singles off the bats of Andres Coll and Dylan Sprague would make it 7-1. The North Stars had four relievers that combined to shutout the Blue Sox in the final six innings. Shaq Thompson, who earned the win, was the most effective, striking out five in his two innings of work. It was all North Stars in this one as they walked away with a 13-1 victory. Click here for the CWL standings. Tomorrow is an off-day for all players as we head into the playoff season. Matchups for day one of the playoffs will be announced tomorrow.